What do lung findings mean? I know what you're thinking...lung ultrasound in asthma?! - they should have a totally normal lung ultrasound, right? Traditionally, harkening back to the BLUE protocol - diseases such as asthma and COPD were diagnosed on ultrasound once every other cause of respiratory symptoms had been excluded and the patient had no other lung findings or DVT. 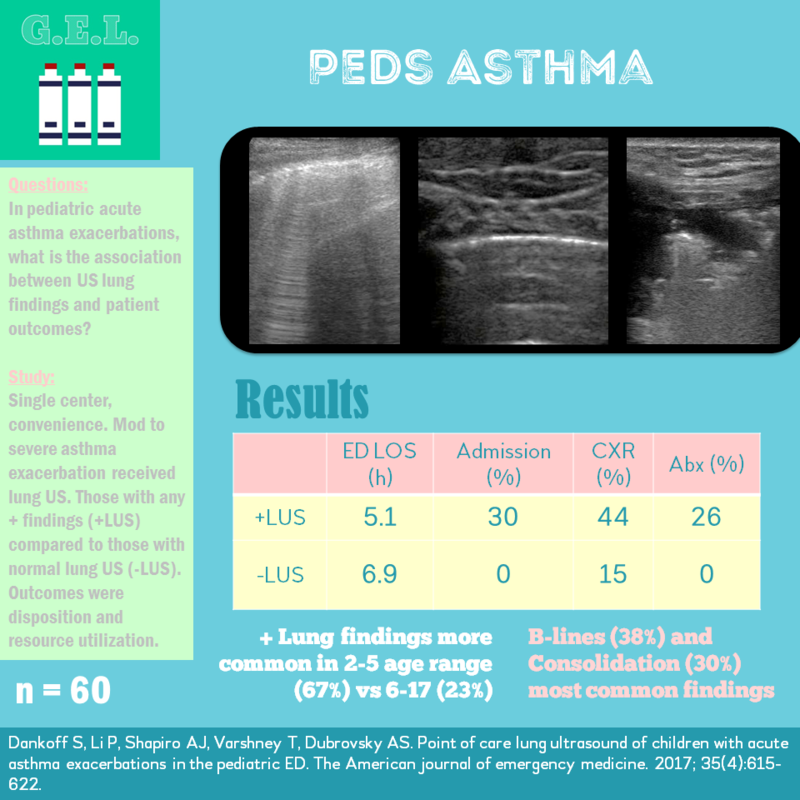 With this background, this study wanted to evaluate pediatric patients in asthma exacerbation to see what lung ultrasound findings might be present, and when they were - what that meant for the patient. This is the second study from the REASON group - one of the most rigorously performed studies of ultrasound in cardiac arrest. 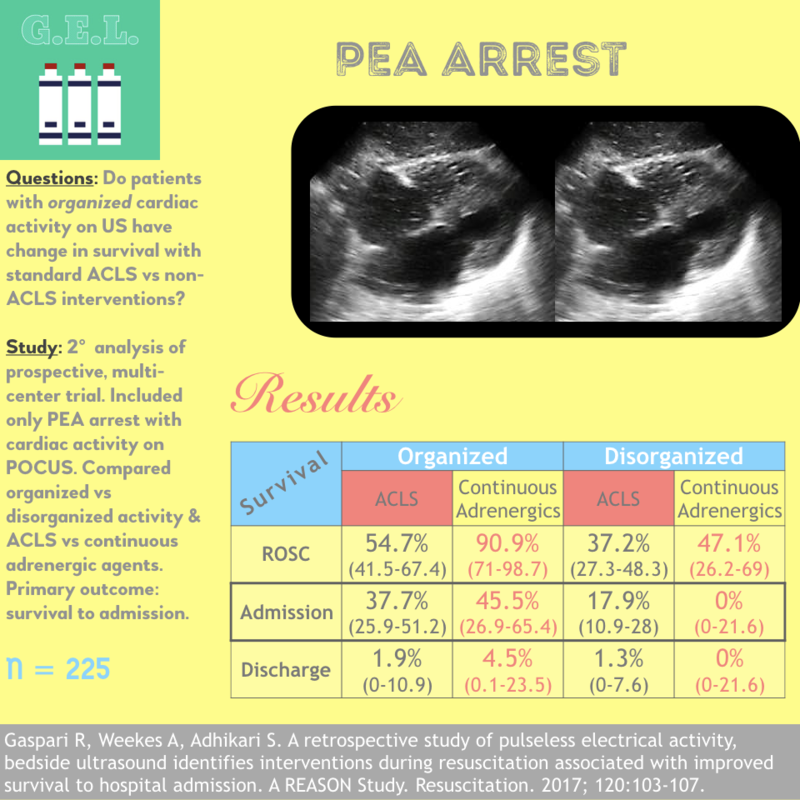 In this article, they are looking at the population in pulseless electrical activity (PEA) with cardiac motion on ultrasound. From this group, they differentiate those with organized rhythms. The idea is that perhaps this population would have a different survival or respond to treatments differently. By reanalyzing their previous data, they are able to answer these questions. We know that POCUS can be used to diagnose many different types of infection. We also know that these infections can lead to serious systemic illness in the form of sepsis. 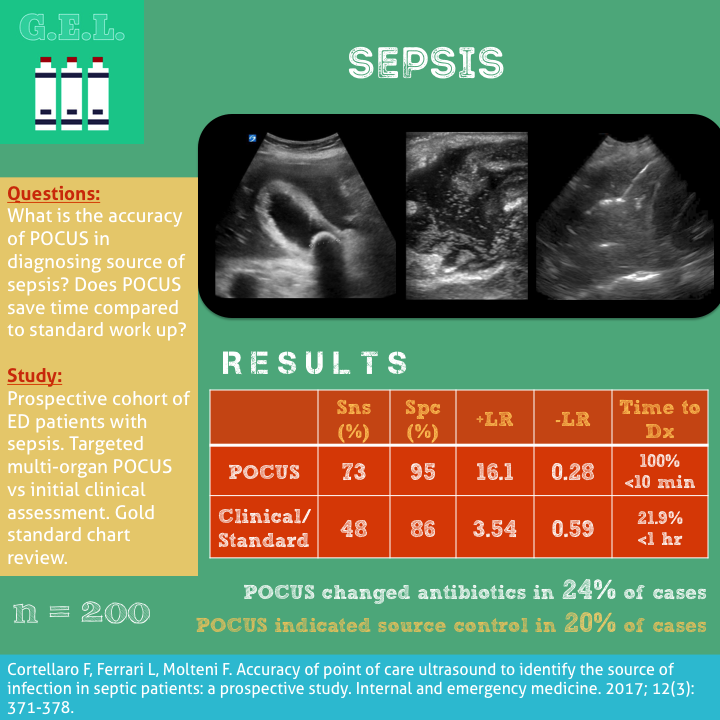 Whenever we see a patient with sepsis, we want to know the source infection as quickly as possible so that we can treat it appropriately with antibiotics and/or a procedural intervention. Therefore, this paper takes a look to see if using ultrasound in the diagnostic work up of these undifferentiated infected patients can help diagnose the source and lead to better treatment.